WASHINGTON, Sept. 17 (Yonhap) — The top diplomats of South Korea and the United States spoke by phone Sunday and Monday to discuss the upcoming summit between South Korean President Moon Jae-in and North Korean leader Kim Jong-un, the State Department said. 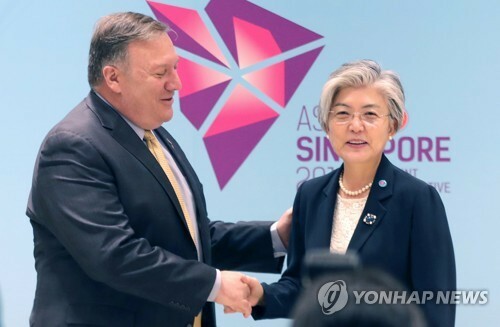 In their two conversations, South Korean Foreign Minister Kang Kyung-wha and U.S. Secretary of State Mike Pompeo talked about the third Moon-Kim meeting slated for Tuesday through Thursday in Pyongyang, State Department spokeswoman Heather Nauert said in a statement. They also agreed to maintain close coordination on efforts to dismantle the North’s nuclear weapons program and continue inter-Korean dialogue and cooperation, she said. “Both sides affirmed the strength of the U.S.-ROK Alliance and the importance to maintain pressure until we achieve the shared goal of final, fully verified denuclearization of the DPRK as agreed by Chairman Kim,” Nauert added. ROK is the acronym of South Korea’s official name, the Republic of Korea, while DPRK stands for North Korea’s formal name, the Democratic People’s Republic of Korea. South Korea’s foreign ministry mentioned only one phone call in a statement released earlier in the day. It said Kang and Pompeo agreed to work together to establish a peace regime on the peninsula in addition to achieving its denuclearization. North Korea’s nuclear program will be among the key issues to be discussed at the inter-Korean summit, according to Moon’s office. Other items will include reducing border tensions and war risks, and promoting cross-border exchanges.